If you are all decked out in your Master Chief gear, then you would surely love to get up and about in the DTV Shredder that you see here. Currently available for pre-order, it will cost you a whopping £3,500 which could be used to purchase a second hand vehicle, but then again would it have an equal cool factor attached to it? 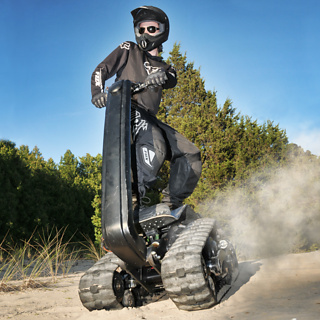 The DTV Shredder intends to “eat up” rough terrain in a jiffy, but do make sure you wear the proper protective clothing before you start ambling about and around in this. This is somewhat a hybrid of skateboard, motocross bike and panzer tank in a single mode of transportation, making it the next generation of all-terrain vehicle. Having picked up the attention of the US military, this rugged one-person vehicle will push the competition into the long grass where handling tough terrain is concerned. The rider will stand sideways on the Shredder, where he/she will be propelled by a couple of enormous caterpillar tracks.